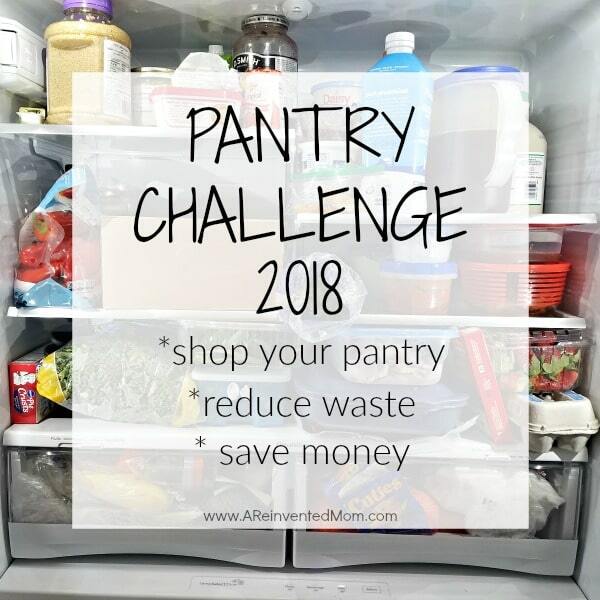 It’s a new year and you know what that means – time to start Pantry Challenge 2018! Let’s use what we have on hand and reap the benefit of a little extra money in our pockets. Happy 2018 Friends! I love the “freshness” a new year brings. It’s a clean slate & the sky is the limit for goals and dreams. For the past several years, I have ushered in the New Year with a Pantry Challenge. In addition to using the food I have on hand, a Pantry Challenge is a time to take a look at how I’m spending my money at the grocery store. Any improvements I can make in my shopping technique will result in extra money in my pocket. I am soooo ready to get this party started! My refrigerators are stuffed with holiday leftovers, the freezers are pretty darn full and my pantry is a mess. Can anyone else relate? I think it’s important to identify why you are participating in the Pantry Challenge. Knowing the “why” will keep you motivated. Are you saving for a summer vacation? Need to pay down your bills? Trying to start an emergency fund? The reasons I’m participating this year are fairly basic. My refrigerators and pantry are busting at the seams. Full of ingredients I purchased to make specific dishes. Dishes that I obviously never made. Full of random “food stuff”. I think we’d eat well for a few months if we had to hole up for a Zombie Apocalypse. Time to whittle down the supplies to a more manageable level. To reduce waste. If I don’t use it up now, there is a good chance the food will expire and end up in the garbage bin. I hate food waste – just ask The Teens. I am (still) making payments on The Boy’s surgery from a year ago. I’d like to get these bills paid off by the end of the year. The savings I realize from the Pantry Challenge will push me closer to achieving this goal. I tailor the Pantry Challenge to fit what works best for me and my family. What works for my family may not work for you. Feel free to change things up to best accommodate YOUR needs. Change the length of the challenge. Include a small grocery budget for limited items. Make whatever changes you need to set yourself up for success. I am most successful with a 3 week duration. Four weeks of a Pantry Challenge is just too much for me (and my family). My creativity and interest have flown out the window by the end of Week 3. The shorter duration will still allow me to accomplish my goals of using food on hand and saving a little money. I like to budget a small amount ($35 per week) to cover necessities. My necessities may be different than your necessities. I believe this sum will cover fresh produce, milk, bread and a few weekly treats for the Teens. These items will keep my people happy. If my people aren’t happy, Mama isn’t happy. If Mama isn’t happy, the Pantry Challenge comes to a screeching halt. I am attempting to significantly whittle down the food I currently have in the refrigerators/freezers and the pantry. I’m NOT trying to completely empty these areas. I fear it would take months & a lot of aggravation to achieve complete emptiness. No one got time and energy for that! Complete an inventory of the food you have on hand. It’s difficult to use what you have if you don’t know what you have – make sense? In addition to taking stock of food you have on hand, it also allows you to toss out any food you find that is past it’s expiration date. I’ve included a FREE Pantry Challenge Inventory Sheet Printable below to help you with this task. If you have a little extra time, try to organize your pantry. While it’s not critical, I do find it helpful to work from an organized space. I’ll be spending a little time organizing my pantry – it’s a mess. Meal plan. Meal plan. Meal plan. I can’t stress this enough. Using your completed inventory as a reference, plan your meals for the week. Take into account any perishable items that need to be used first. This is the easiest way I’ve found to make the best use of food on hand. As you use up items, be sure to cross them off your inventory list. I’ll be updating my progress in a weekly recap on the blog. I will also try to post regular photos of some of the meals we are eating on Instagram and Facebook. Is this your first Pantry Challenge? Or are you a veteran participant? What areas do you struggle with the most? If you have any questions, submit them in the Comment section. I’m here to help you! I’d love to see what you are creating and eating, too. Please share your progress in the comments below. Share a photo on Instagram using the hashtag #pantrychallenge (be sure to tag me @areinventedmom so we can connect). Or post your updates to my Facebook page. Whatever method you use to share, let’s support each other. If you are looking for more Pantry Challenge inspiration, check out Good Cheap Eats. Jessica is the Queen of Pantry Challenges and first introduced me to the idea.